Two of my favorite foods, wild salmon and sorrel, arrive in the market at about the same time in mid-May. Along with asparagus and strawberries, sorrel signals spring and a season of lighter fare, moving away from wintry stews to simple, freshly cooked dishes highlighting garden produce and fresh fish. Speckles of brilliant green dot this cream soup, thickened with potatoes and full of the tangy, lemony flavor that sorrel imparts. 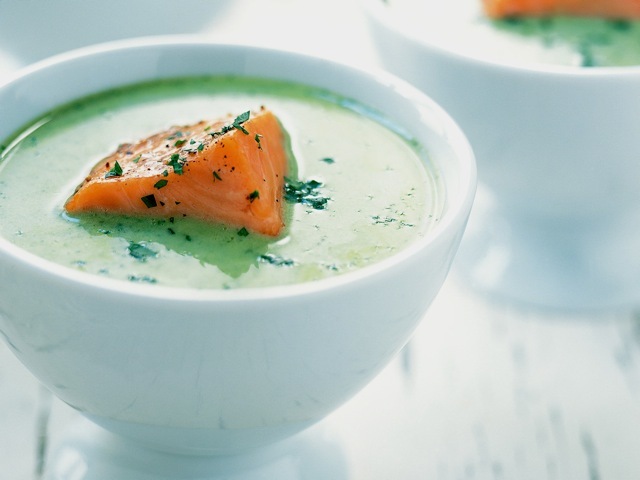 Served in a shallow bowl, a square of delicately pink roasted salmon sticks up in the center, surrounded by a pool of the luscious green-hued soup. Serve this as a light supper with a loaf of crusty bread or for brunch. Be on the lookout for sorrel — even ask your produce buyer to stock it — but if it isn’t available, fresh watercress is an acceptable substitute. In a heavy soup pot, bring the stock to a boil. Add the potatoes. Lower the heat to a simmer, partially cover the pot, and cook the potatoes until tender when pierced with a knife, about 15 minutes. Meanwhile, arrange the salmon on a rimmed nonstick baking sheet or line a baking sheet with parchment paper. Rub the salmon with a little olive oil and sprinkle each piece lightly with salt and pepper to taste. Set aside. In a food processor fitted with the metal blade, purée the sorrel, pulsing on and off for about 30 seconds. Add the butter and process until the sorrel is completely puréed and blended with the butter. Transfer to a small bowl, cover, and set aside. When the potatoes are tender, place the salmon in the oven and bake until the fat between the layers begins to turn white and the fish flakes slightly, 20 to 25 minutes. The fish will appear to be underdone because the color is so beautifully pink and vivid, but it should be fully cooked. While the salmon is baking, finish the soup. Using an immersion blender, purée the soup directly in the soup pot. Alternatively, working in batches, purée the soup in a regular blender and then transfer the soup back to the pot. Add the cream and stir until the soup is barely simmering. Add the sorrel butter and stir until well combined. Add 1½ teaspoons of salt and a few grinds of pepper. Taste and adjust the seasoning. Keep warm until the salmon is done. To serve, ladle about 1¼ cups of soup into each of 4 warmed large, shallow soup or pasta bowls. Carefully place a piece of salmon in the center of each bowl and garnish with some minced parsley. Serve immediately. Try serving this soup with an Austrian grüner veltliner; an Oregon or Alsatian riesling; or a sauvignon blanc.